I’ve been so excited to share this room and the day is finally here when I can say its done! Welcome to the coolest room in the galaxy! (keep scrolling to get this reference if you don’t already know). This space (haha..another pun) belongs to my son Wyatt, who just recently turned 7. He is VERY INTO Star Wars and outer space for that matter so I had to pay tribute to that in my own stylistic way. We originally started with a very light gray color in here, but I honestly didn’t love it and it also read a bit purple. No bueno. So, I took a chance and went to the dark side and I’m so happy I did! 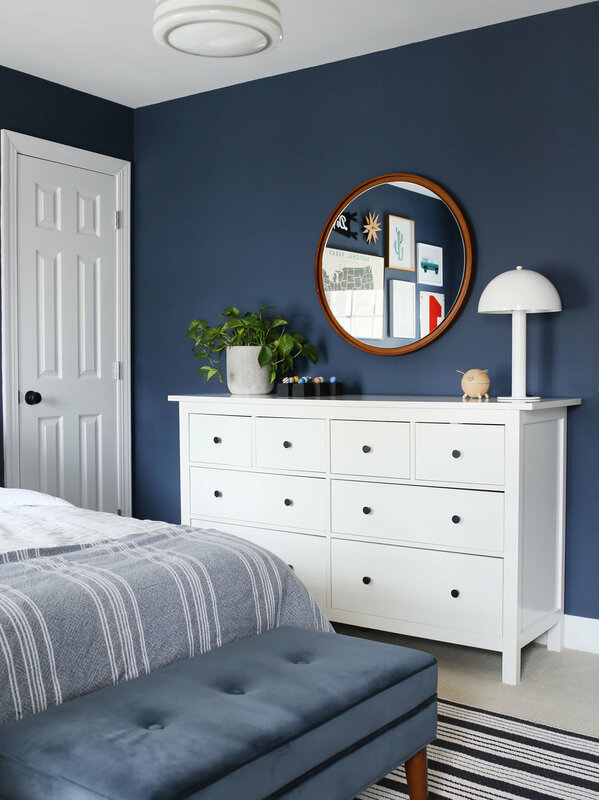 The color is the ever famous Stiffkey Blue by Farrow & Ball (in their Estate Emulsion finish) and its perfect moody, yet happy shade of inky navy that sings in this naturally bright room. I can’t seem to quit them even though they can be downright challenging and time consuming! I won’t admit to how many hours I spent tweaking this particular one, but it was a very healthy amount! Lots and lots of trial and error! I used a mix of art – some of it new, some vintage and some repurposed in different frames I had on hand. My goal was to keep the color palette generally consistent and mix in different styles for a collected look and feel. Pro tip: mix in a few simple and minimalist pieces (like black and white line art) to more traditional and dominant mediums for balance. This reduces some of the visual clutter and gives your eyes a break. I found the peace sign print and the cycling dino skeleton on Etsy, downloaded them and printed at home. Easy and budget-friendly! We added that amazing Parsons Tower from West Elm to the space between the windows. Its huge and incredibly well-made and houses a lot of legos and toys! In fact, most of all those bins are full of legos! I’m fairly certain I need several of these for my future studio! 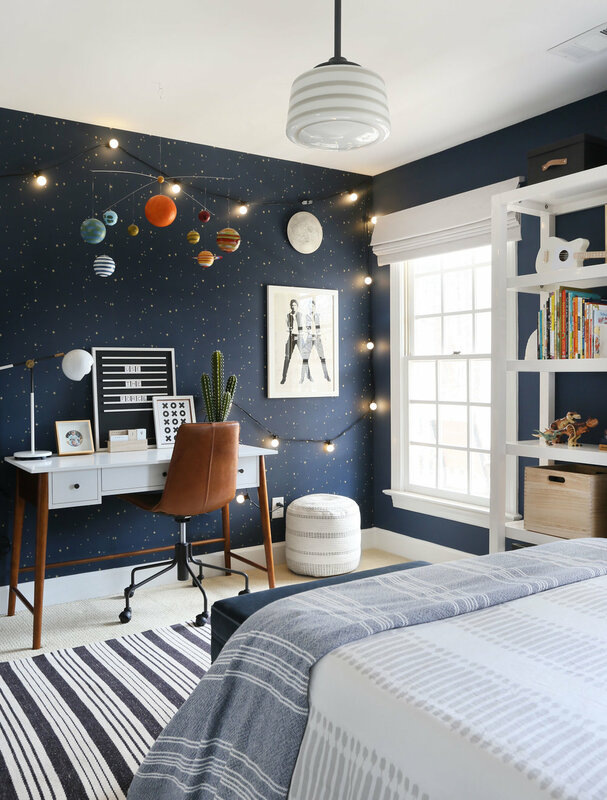 I found that amazing Constellation wallpaper last year (it’s Chasing Paper for West Elm) and knew that would be the inspiration for this room. And as an added bonus, it blends seamlessly with the paint color so the entire space has a nice flow! I layered in a few additional pieces including that super fun moon light (which doubles as a little night light and is the coolest thing), the incandescent string lights and the solar system mobile. The other side of his room I kept pretty clean and simple with clothing storage in mind. We used his existing Ikea dresser (a hold out since birth) and added some simple matte black pulls to freshen it up a bit. Even a tiny little change like pulls can do wonders! That beautiful (and heavy) floating wooden mirror from West Elm is built to last and makes the space feel bigger and more open. And that about wraps it up! This room is just fun to be in (and sleep in)! He has a new Lull mattress and it is to die for comfy! I just love this room and I hope my Wyatt will for years to come! As always, I did my best to round up most of the sources (if they aren’t listed then they are either discontinued or vintage). Check out the graphic with 30 links below.